Q: As an animator, how do you view comics today? A: Comics is all about storytelling. Even film and animation, they’re all about storytelling. Comic books have become much more sophisticated since then – applying a lot of techniques - thousands of techniques. In fact, it tries to apply other media. For instance, photography. Q: What is the most challenging part of being an artist? A: The job of the comic book artist is really to create the illusion, the movement because you know, obviously, the job is to create action within space. As an artist, you need to create the illusion of an action. Q: How did you change from one medium to another? A: In fact, comic books helped my transition to animation. I had to relearn what comic books are, what made it work for me, what are the techniques that make comic books work. Q: Which do you love more? Comics or animation? Q: What is your message to all the aspiring artists and animators? 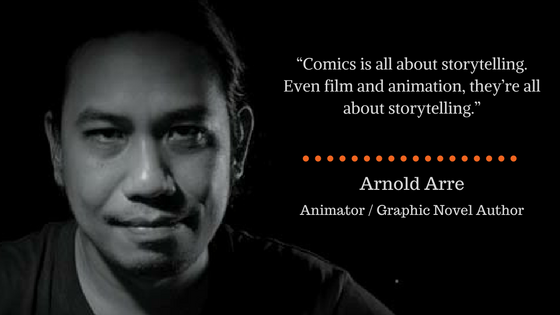 The animator and graphic novel author Arnold Arre was one of the speakers on comics and animation during the 10th Animahenasyon held on November 22-24, 2016 at Samsung Hall, SM Aura, Taguig City.